Jerry's site was designed for optimal viewing when your monitor's screen resolution is set at 1024 X 768 pixels. Click the "Start" button at the left bottom corner of screen. In the Control Panel, select "Display". NOTE: Another way to access the Display is to right click on your desktop and click "Properties" (Your "desktop" is the first screen with all the icons that you see on your monitor when you start your computer). In the Display Properties box, select the last tab, "Settings". Find the "Desktop Area" box, and move the slider to "1024 x 768". Find the Colors box, select "High Color (32 bit)". Click "Apply". Your computer will switch to the correct resolution and ask if you want to keep this setting. I cannot hear music on Jerry's pages, and/or none of the animated graphics are moving. In the Control Panel, select "Internet Properties". 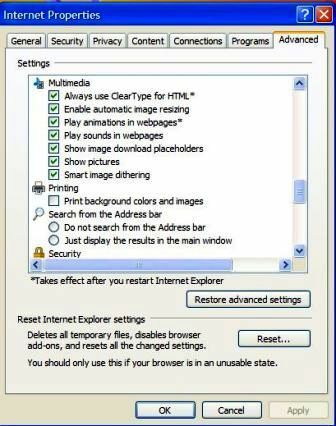 NOTE: Another way to access "Internet Properties is to open Internet Explorer, click "Tools" on the top toolbar, then click "Internet Options". On the tabs across the top of the little window, click "Advanced"
Scroll down the options list until you come to "Multimedia". and verify that options "play sounds in web pages" and "play animations in web pages" are check marked. (see illustration below) Depending on which version of Windows you are using, your options may be somewhat different, however, you still should be able to locate these options to verify that they are activated. Have you installed the Latest Media Players? "Okay, finally figured it out. My husband went into “tools/internet options/advanced” and unchecked the two boxes for “disable script Debugging” and now the web site works just fine. Thought I would let you know in case someone else is having the same problem." You might need new Plug-ins or Medial Players for your browser. Be sure you have the latest browser updates. You might only be using a dial-up connection. You need High Speed Internet Access for many of these pages. Be sure you have the latest browser updates.